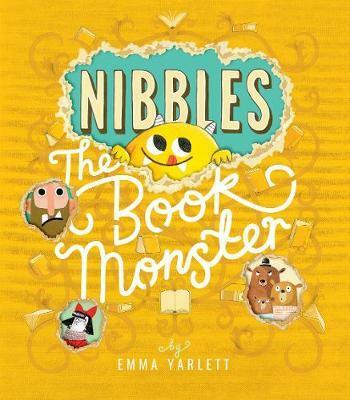 Meet Nibbles, an adorably too cute monster who likes to nibble on everything, from socks and clocks, to toes and soap, but Nibbles' favourite thing to nibble on? This is such a fun story, asking for the reader's involvement to track, spot and eventually capture Nibbles as he chomps and chews his way through books other than his own. As the reader follows Nibbles' footprints, they find that he has interrupted multiple fairytale stories, including 'Goldilocks and the Three Bears', 'Red Riding Hood' and 'Jack and the Beanstalk', and none of the characters are particularly happy with his interruptions. Finally however, Nibbles is once again returned to his cage, in his own book. But wait a minute...did you hear that noise? The overall production of this book is beautiful and fantastically original. The cloth bound hard cover has a gorgeously embossed swirly lettered title which is surrounded by cheeky chewed holes. There's a flap to open Nibbles' cage (oops! I think you let him out!!) and holes through out the book where Nibbles has escaped. The most brilliant element though, is how the book within a book has been approached. Each book that Nibbles chews into, has been attached to it's own page, so the reader essentially has to lift multiple flaps to chase Nibbles through that story and as he leaves that book, the reader then turns to the next page and finds out the next book Nibbles has nibbled his way into. It's really rather brilliant! I read this with my five and three year old and while the fairytale references might've been a little bit lost on my littlest one, he was still utterly enthralled by the chewed holes, nibbled edges, flaps, books within the book and of course finding where Nibbles has gotten to next. The artwork is beautiful, vibrant and detailed. Both my kids asked for an instant re-read, so I have a feeling this will be our bedtime story go to for weeks to come. I am in no way upset by this, in fact I can't wait to explore this book all over again!